Maybe the first more or less scientific article about moving on ice skates was written in 1892 and published February 27 in De Nederlandsche Sport, a general magazine on sporting. It was written by Ubel Wierda who argued that ice skating is a gliding motion contrary to the rolling motion of walking. He condemned the then popular thought that it would be good to make the connection between boots and ice skates as immovably as possible. Also he rejected high and curled necks. Two years before he had published an article about the physical phenomenon that ice becomes fluid when under pressure thus forming a gliding film. In a brochure that was published in 1908 he states that he has been concerned with these questions for over 20 years and that he is convinced that making ice skates is done with 'feeling' rather than with ratio. He concludes that most ice skates are unsuitable to give the rider optimal skating pleasure. Runner blades should differ in height, width, length and curve he argued depending on the kind of skating the rider should want to practise. The well prepared rider therefore should carry several pairs of ice skates with him as he seldom knows beforehand what it will be today. Only at the ice he would be able to decide whether he would ride a touring track or show his ability to ride figures or challenge a friend to measure their speed skating strength. Hence, if carrying just one pair of ice skates it would be the wrong choice most of the time. So, he designed a system consisting of a platform with interchangeable runner blades that could used in two ways by turning the blades top down (see details 1 and 2). The rider then could suffice carrying not more than an additional pair of blades. He called this the Omniplex system. This design was patented in 12 countries. The rights for the Omniplex system were acquired by a Mr. Tönnies who began producing ice skates with interchangeable runner blades in 1896. The Multiplex ice skates, as they were called, consisted of a metal platform with small consoles against which the runner blades could be mounted by means of a simple kedge system. These came with a pair of runner blades that could be used both for speed skating and for figure skating. One side of the blades was thin, long, low and ground straight suitable for touring and the other side was thick, short, high and ground round for skating figures. The platforms had straps that could be adjusted easily. It was expected that the Multiplex system would cause a revolution. A brand new factory was built and a 32 page brochure in 4 languages (Dutch, English, French and German) was printed and even a Multiplex ice skating waltz with 7 stanzas was composed. The brochure says that the skates are now delivered with just one set of runner blades but that further sets will be available in the immediate future. The whole undertaking became a disaster. As often is the case the market did not buy the technical advanced concept and the company was closed in 1904. In 1908 the same Ubel Wierda wrote a booklet for G.S. 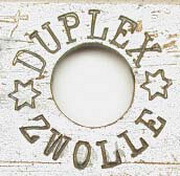 Ruiter, skate makers at Akkrum, in which the word Multiplex is not used. Yet the Omniplex system is described but now it is called the Wierda ice skates system. It is interesting to read about Simplex, Duplex and Omniplex runner blades. This might be caused by the situation with concern to the patents and still applying rights. This type of ice skates with the mark of G.S. Ruiter have never been traced and it is therefore thought that they have never been made. Approximately at the same time similar ice skates, but now with traditional wooden platforms, were offered by H.J. Gorter, skate makers at Zwolle. 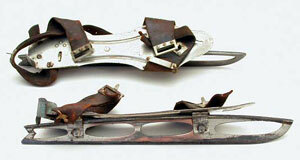 These skates are known as Duplex skates. These skates do not use a kedge system for changing runner blades, but screws with a triangular head requiring a special tool. It is unclear whether they were designed by Gorter himself, who had a reputation as innovator, or that he bought patent rights from Wierda. A hundred years later another system for quickly changing runner blades attracts attention again. Now it concerns a method to exchange the blades of speed skates of the Norwegian model. The idea is based on experiences with marathon skating (about 200 km) on natural ice. As natural ice cannot be prepared well chances of burrs and bended or even broken blades are great. This can mean that races can be lost after having skated for a hundred kilometres or more just because of material failure. So, well-known Dutch marathon skater Jan Maarten Heideman designed a system that makes it possible to exchange a bad blade for a better one without pausing, i.e. while skating. A further advantage of this system is that instead of blades also some kind of sole can be attached making it possible to walk from the ice without changing boots. The prototypes have been made by Dutch skate makers Raps in Almelo. Though not yet ready for serial production the experiences are positive and it is expected that these ice skates will become available for commercial selling. 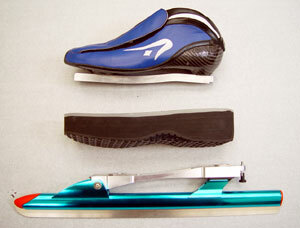 The picture shows that the system comprises three parts: a boot, a sole and a clap skate frame with runner blade. 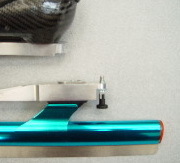 The rider can attach a sole or frame at choice. The connection is made by means of a simple slide-and-click system. At the rear end of the frame piece the quick connection locking pin can be seen. By puling this pin the connection is disengaged.